A pawl on the stemhead roller acts like a ratchet—it lets you pull chain in, but prevents it from running out while you have a rest. In waves, let a rising bow help pull in the chain. B. The “spring” that holds the pawl on the chain can be a shock cord that also acts as a lanyard when the pawl is removed. It can also serve as a C. counterweight. 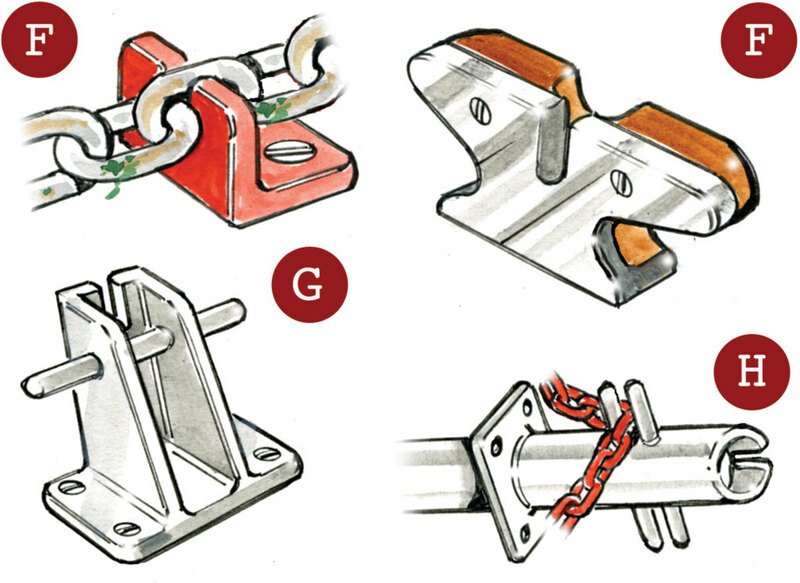 D.Most pawls are custom-made, but you can buy commercial ones intended to prevent the chain on a windlass from running out. E.The geometry of this notched plate, lets it hold the chain and be flipped clear. F. Simple notched plates will hold the chain while you take a breather. Off-cuts of thick aluminum or stainless steel angle can be found in scrap yards, and some people beef them up to form cleats. G.Sampson posts with a notch can be fabricated to various designs. H.This one goes through the deck and has a top notch and twin bars. 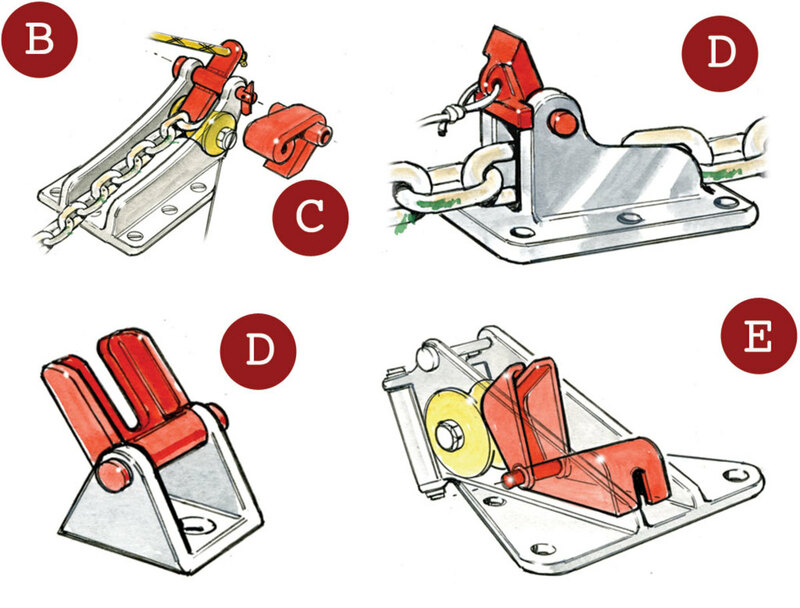 I. Anchor loads can be transferred from the windlass to a cleat with a stopper. 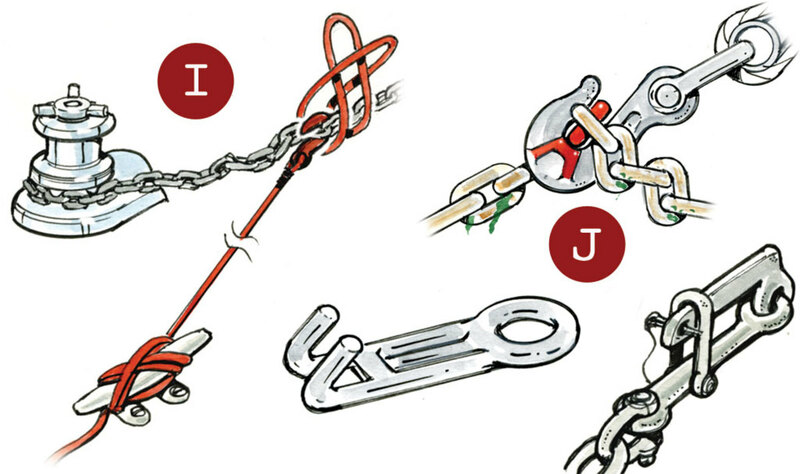 Fix it on with a rolling hitch, strop or chain hook. J. Hooks (or devil’s claws) come in all shapes and sizes. An increased bearing surface or “saddle” is kinder to the chain. Check their strength and size if necessary.